RIO RANCHO, N.M. — Armed with his Nikon D200 camera, a 70-200 millimeter lens, his trusty horse Harry and his cowboy hat, Steve Simmons is ready to ride alongside and photograph New Mexico’s wild horses. Simmons, an 18-year resident of Corrales, is a horse admirer. 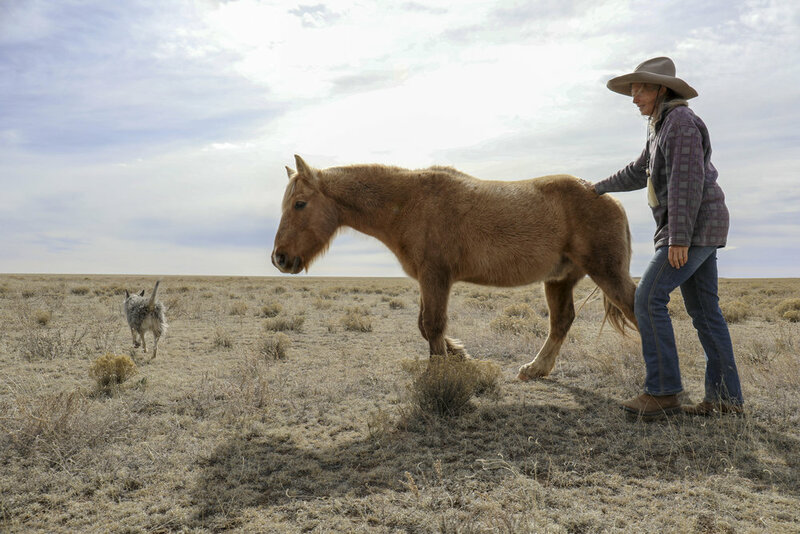 He owns eight Morgan horses, advocates for wild horses and documents and studies them through observation and photography, which he has done for 11 years in the wild. “I love tracking and photographing them with my own horse. I love to ride, and being on a horse, looking for other horses just seems to be the way to do things … Doing this on horseback has made me a real student of horse behavior,” Simmons said. One of the main changes and challenges Simmons has seen in the environment is man’s impact upon the landscape, which in turn affects the natural ecosystem of the land and its animals. “The biggest problem out there is a lack of water. In Placitas, there is a lack of water and forage, although those needs are taken care of by residents who put out feed and water. Feeding free-roaming horses creates a lot of problems as the herd sizes will grow,” Simmons said. “They double in size about every four years. Managing herd populations in place takes a lot of time and patience. According to The Science and Conservation Center in Billings, Mont., darting wild horses with zona pellucida, a glycoprotein that surrounds the egg to keep it from fertilizing, requires training, which takes place at the center at ZooMontana. Upon completion of the class, the program provides individuals with the necessary mixing equipment. The individual will then begin the process of documenting the mares that have been darted with zona pellucida, or PZP, log the progress for a certain length of time, and observe if the mare gives birth at the end of the breeding season. 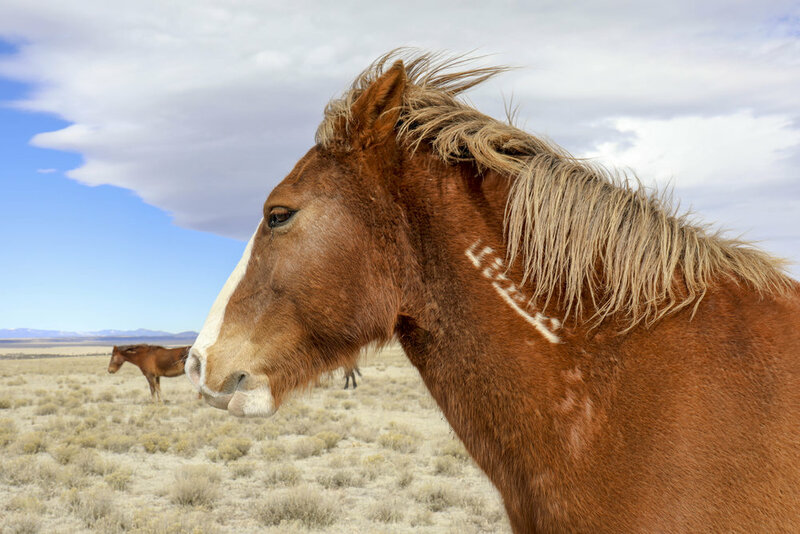 Based on research Simmons gathered from the National Academy of Science in 2013, managing the herd population in place through this method is the best solution to the wild horse conundrum in Placitas. He engaged with the conversation in Placitas because he believes it’s time to give back to America’s wild horses. Simmons has a special bond with his horse Harry. He came across Harry by a stroke of luck or miracle — whatever you’d like to call it — but to Simmons, Harry is his guardian angel. Simmons recalls being 10 years old and his grandmother telling him he had a guardian angel that would keep him out of trouble. Simmons believes Sandoval County has an opportunity to do something and to do it well with the Sandoval County Free Roaming Horse Advisory Council. “We need to put out the work to do it because if we don’t, we are going to destroy this planet. You know horses are a part of that,” Simmons said. The sound of hymns echoes through the hallway of the Felician Sisters Chapel on a crisp Wednesday morning in November. It’s 7:15 a.m., and two of the three sisters have been up and going since 5 a.m.
Every morning, the sisters open the chapel to the public to join them in Mass. The women pray twice a day together and individually as needed. “Well, the most important thing is our prayer life. 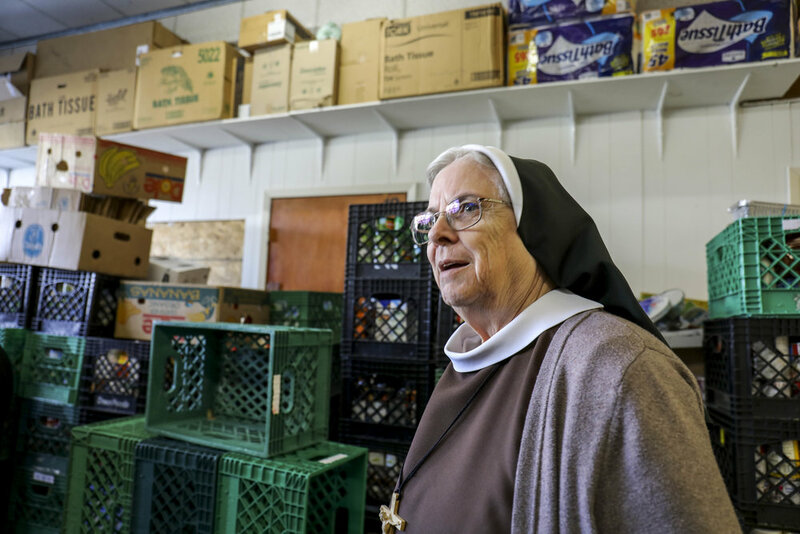 We have to start our workforce with our prayer life and end with prayer life, or even when we walk, we pray,” said Sister Angela Parkins, the CEO of St. Felix Pantry. For each sister, the calling of becoming a nun happened at different times in their lives, at different ages and different education levels. A calling is a spiritual leading or a sense of direction from God. For Sister Jane Mary Gawlik, it was as young as 5 years old. Parkins had a full career before she entered the convent at 47, and Sister Barbara Kopecki at 17. Juggling their own ministries from their everyday lives isn’t easy. Parkins is caught between being a full-time CEO and being present at the convent. According to Gawlik, living as part of a sisterhood can be a mix of emotions. Comfort and the companionship of sisters who share the same goals and are supportive of each other are the redeeming qualities of living life in a convent, according to Kopecki. Despite their busy days, the sisters make time in the afternoons to pray together in their private chapel, followed by dinner together. Afterward, the women read or catch up on sports. For Parkins, it’s watching the Ohio State University football team during Monday night football. The convent is undergoing a renovation to better accommodate the women. 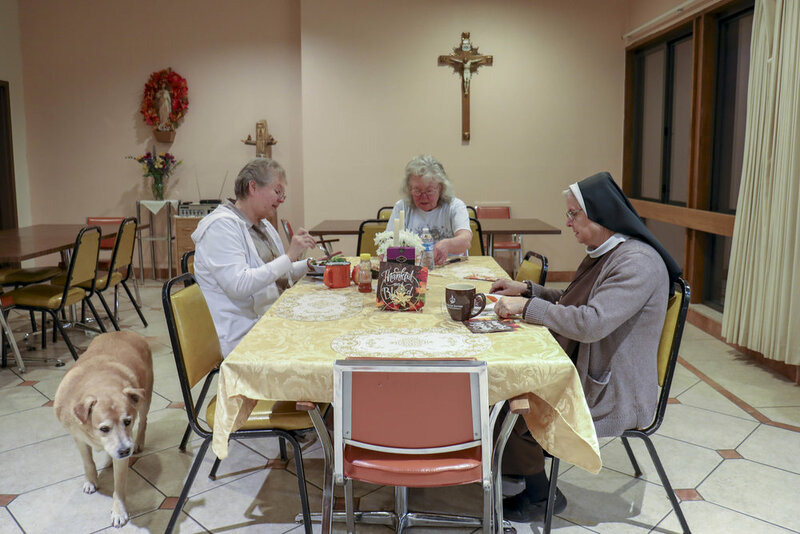 The Felician Sisters Convent is located at 4210 Meadowlark Lane and has been a part of the Rio Rancho community since 1976. If you are a woman interested in more information on how to become a Felician sister, contact Gawlik at 892-8862. Clouds of dirt swirled around the matachines feet as they danced up the Tijeras hills to bless the Ojo spring on a smoldering Saturday morning in June. As they danced they were covered from head to toe in copilas resembling a bishops mitre, veils over their eyes, and black decorated blazers with ribbons and rattles. Maneuvering up the winding and at times narrow hills was not an easy feat, yet, the matachines did not miss a step as they moved in mesmerizing unison. According to legend the Ojo dried up one year when the church father failed to bless the spring. The procession carries on 200 years later for the faithful churchgoers of San Antonio Church. Those in the procession hope each year that once again water will flow from the hilltop. At the helm of such procession are generations of families that have taken up the mantel to pay homage to the local church’s patron saints such as the Chavez family. Ted Chavez, 53, has been leading the danza or dance as title of Monarca (monarch) for 20 years, but has participated in the procession for 37 years. Chavez’s granddaughter, 8-year-old AnnAlycia Trujillo has started leading the procession alongside Chavez in the role known as La Malinche, who represents purity and all that is good. Apart from the homage of the procession, the church fiestas also consist of visperas, feasts and plays that bring together all members of the community. Next year San Antonio Church will be celebrating their bicentennial. Since the election of President Trump, the future of students under DACA is unknown and many Dreamers are worried not only about what this means for their future, but also for the safety of their families. Medical student Yazmin Irazoqui Ruiz remembers the moment when her world didn’t seem so certain anymore, just five days after President Trump’s inauguration. “Jan. 25 was the first border security executive action, and that was the proof I needed to realize that Trump was going to go after what he said he was going to do,” Ruiz said. The Deferred Action for Childhood Arrivals was first enacted by the Obama administration in June 2012, and the UNM Dream Team estimates that there are approximately 500 undocumented students at UNM alone. Trump’s hard-hitting executive order has awakened the long held dormant fears of the undocumented student population. For Ruiz, this meant taking a leave of absence from the UNM School of Medicine. Josue de Luna Navarro, a chemical and biological engineering student, understands what it’s like to sit in class attempting to learn, yet deal with more pressing things on his mind. Although DACA holders are not protected against ICE and deportations, they are on lower priority on deportation lists and do have certain benefits. One of the benefits is the ability to obtain a worker permit, which would allow the individual to work in the U.S. without the need of a social security number. For one UNM alumni, who seeks to remain anonymous due to her work status, DACA afforded her the means to pay for college, as she could obtain a work permit. Undocumented students not only face the pressure to maintain scholarships, but deal with the uncertainty of possibly having family members deported. So much so, that the UNM Dream Team Field Coordinator Felipe Rodriguez has helped devise Deportation Protection Plans for students and their families. With so much on the line, some say it seems almost impossible to have a moment of tranquility. For Navarro, he finds solace in meditation. For Ruiz, tranquility comes in the form of dancing “bachata,” a style of romantic music and dance from the Dominican Republic. She also finds solace in speaking Spanish and being a part of the Dream Team.